In a conference call Friday, Lionsgate CEO Jon Feltheimer spoke about the future of the ‘Ender’s Game’ franchise. Lionsgate already owns all the firm rights to the Enderverse; now they only have to consider what to do with the rights. Feltheimer says Lionsgate will wait a week or two before deciding whether to another make a TV spinoff. Earlier this year, the producers of the ‘Ender’s Game’ film expressed their interest in making a Shadow series spinoff. If you haven’t seen the ‘Ender’s Game’ movie yet, read our spoiler-free movie review here. Buy Ender’s Game tickets now! 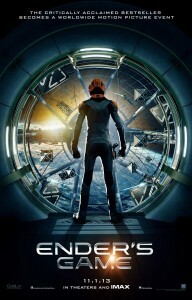 The ‘Ender’s Game’ film was released in U.S. theaters on November 1, 2013.